Old fashioned Pancake Recipes includes buttermilk pancakes made from scratch using self-rising flour. They are no longer limited to the breakfast meal as they were in the olden days... restaurants serve them the world over, day and night. 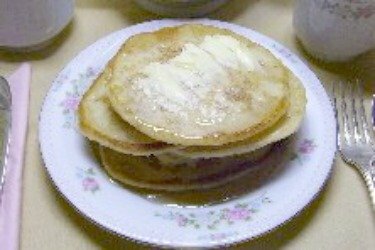 The following Waffle and Buttermilk Pancake Recipes were given to me in the 1970's when we were with family and friends, camping out. Made with self-rising flour, these pancakes can be made almost as quick and easy as using a boxed mix. Beat egg in mixing bowl. Stir in melted butter and buttermilk. Add flour and mix 1 minute or until smooth. Pour enough batter onto a lightly greased hot griddle or into a preheated skillet** to form a circle the size you prefer. Cook until done around the sides and bottom is lightly browned. Turn over and cook the other side. Serve immediately with syrup or other toppings of your choice. The most popular way to serve them is with butter and traditional maple syrup. They are delicious served topped with fruits such as fresh or frozen blueberries, strawberries, blackberries, pineapple, or bananas. Makes 12 thin medium sized pancakes. For thicker cakes, use less buttermilk. *The original recipe called for 6 tablespoons vegetable oil. I use butter for a tastier pancake. You may use your favorite oil, if you prefer. **If using an electric skillet instead of a stove-top pan, preheat it to 325F. Regular sausage patties or links, Polish Sausage, bacon and eggs are excellent side dishes to complete your meal. Reduce buttermilk by 2-4 tablespoons and cook in a waffle iron per manufacturer instructions. Made with Blueberries, topped with cream cheese and corn syrup. Made from your own mix (recipe included). Delicious served with regular syrup, bananas, strawberries or ice cream. Also known as Potato Latkes. Serve for breakfast, lunch or dinner. No one knows who invented pancake recipes, but history traces them back to the 4th century B.C. Although cooks were already making pancakes, Henry Charpentier, a famous chef who emigrated to America in the 1930s is credited with populating them around that time. In the early 1940s my Momma made what she called "Fry Bread". It was thin cakes cooked in an iron skillet on a wooden cast iron cook-stove. We had no oven, so all her breads, including biscuits were cooked that way. I don't know how she mixed her batter (I was real little), but I remember standing nearby the stove, smelling the good stuff, and waiting for my piece of bread. Sometimes she gave them to us plain and sometimes with her homemade jellies or jams. Other times she would place them on a plate and top them with homemade butter and Karo syrup. Today, she would call that a pancake! My 1947 edition of The Boston Cooking-School Cook Book by Fannie Merritt Farmer has recipes for them referred to as "Griddle Cakes". The book also lists a Russian "Pancake" with instructions to spread it with a spoonful of caviar, cover it with cream and place another cake on top. She suggests serving it as a supper dish with a salad and dessert.